Acid reflux is a painful condition that can cause burning in the chest, in the upper abdomen and behind the breastbone. Eating certain foods -- such as those high in fat and spice -- is often a trigger for the onset of acid reflux. People who love hummus may still be able to incorporate this food into their diet by making some changes to the basic recipe. Acid reflux -- or gastroesophageal reflux, as it is sometimes called -- is a condition characterized by the regurgitation of stomach contents back into the esophagus. While acid reflux can be caused by a number of factors, weakness in the lower esophageal sphincter is often to blame. Those who have acid reflux are often encouraged to make changes to their diet. In fact, restricting the intake of certain foods -- such as chocolate, peppermint, coffee, tomatoes, alcohol, spicy and fatty or greasy foods can be an effective way to keep acid reflux in check. Hummus is a classic Middle Eastern paste often served as a dip or spread. 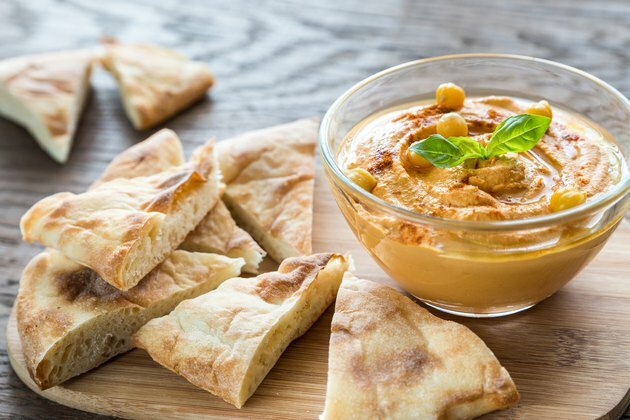 While the ingredients featured in hummus may vary, it traditionally includes chickpeas, ground sesame seeds -- or tahini paste -- olive oil, lemon juice, garlic, herbs and spices. According to Jackson Siegelbaum Gastroenterology, people with acid reflux should avoid fatty foods at all costs. The significant amounts of both olive oil and tahini paste in hummus means that this food is fairly high in fat -- in fact, if you eat a 2-tablespoon serving of store-bought hummus, you can expect to consume 5 grams of fat, which is about 8 percent of the daily value for fat. The spices used in classic hummus recipes -- such as garlic, cumin and red pepper flakes -- can also be triggers for the onset of acid reflux. By creating your own hummus at home, you can make variations to the traditional recipe and thereby reduce the amount of fat and spice. Consider replacing some of the olive oil and tahini paste in hummus with water for a lower-fat food. Or omit the tahini and use only 1 tablespoon of olive oil for the whole recipe. Choosing spices that have not been acid reflux triggers in the past can also be a helpful way to keep symptoms at bay.